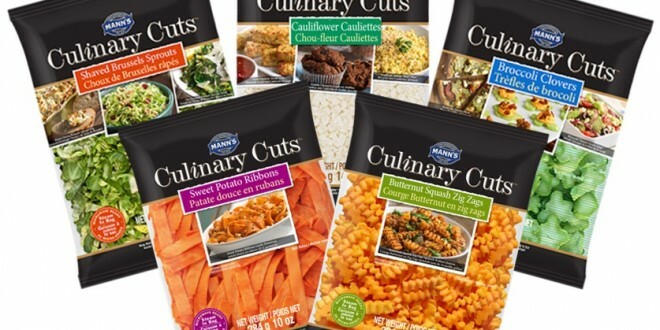 Salinas, Calif. – Sept. 27, 2016 – Mann Packing announced newly designed packaging for the two original products in its award-winning Mann’s Culinary Cuts® line. The new packaging puts the Sweet Potato Ribbons and Butternut Squash Zig Zags into bags to unify the growing product offerings that now include: Shaved Brussels Sprouts, Cauliflower Cauliettes® and Broccoli Clovers. The full line will be launched in U.S. and Canadian markets with the new look starting October 4, 2016. The products, along with recipes, photos and videos can be seen at culinarycutsclub.com. Culinary Cuts are a revolutionary line of fresh vegetables cut into distinctive shapes. The convenient vegetables are perfect for a pasta swap, are trending, and free from preservatives and gluten. The veggies are washed and ready-to-eat and versatile enough for multiple uses such as side dishes, stir-fry’s, appetizers, desserts and casseroles. Culinary Cuts are the first veggie pasta swap products available nationwide and are backed with promotions and merchandising support to educate consumers and spur sales. The Butternut Squash Zig Zags and Sweet Potato Ribbons are two of the fastest selling branded squash and sweet potato items where sold – AC Nielson 13 W/E_07/30/16. The development of the new packaging reflects Mann’s commitment to providing innovative solutions for consumers. Not only will the appearance of the products be noticeably different, customers will also appreciate the consistency of the look. The new bags feature improved physical characteristics which will enhance shelf life. For more information, visit culinarycutsclub.com, and join the Culinary Cuts Club Facebook group here.